Welcome to my Iceland travel guide and 6 day itinerary! 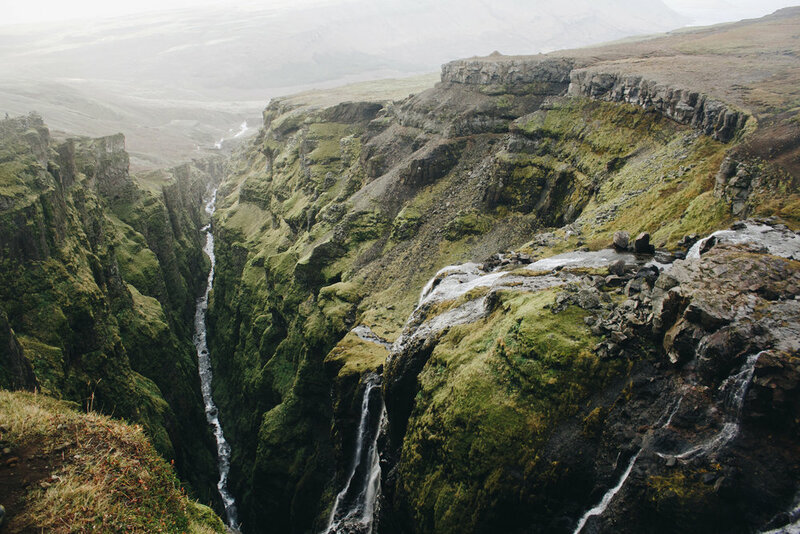 Iceland was at the top of my dream travel list ever since I saw The Secret Life of Walter Mitty (excellent movie, by the way), so I was incredibly excited to finally experience the beauty of Iceland this past October. My birthday was in September and my husband, being the awesome person that he is, surprised me with tickets. He also convinced two of our good friends to come along with us, so the whole trip turned out to be a proper adventure. I must say, I was slightly cautious about visiting in October due to the colder temperatures, and the higher chances of rainfall and snow. However, with a little optimism and a lot of luck, the trip went very smoothly. We experienced a sprinkling of rain on the day that we were set to leave, and that was it! The rest of the days were sunny and beautiful. On top of that, October is a great time to see the northern lights, and we indeed saw them--twice! I'm already dying to return! Overall, our trip was primarily confined to the southwest region of Iceland. 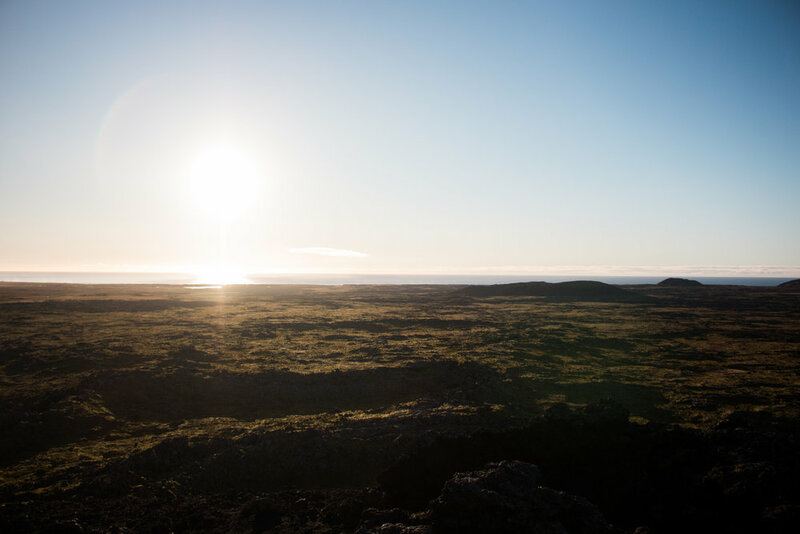 The whole of Iceland has a lot to offer, and rather than trying to see everything all at once, we decided to get the full southwest Iceland experience with the intention of returning someday to see even more. We arrived in Keflavik Airport at around 6am, rented a car from the airport, and set out for our first activity. We were tired after flying for about 8 hours and getting little to no sleep, so we decided to start our trip off with a short hike to Reykjadalur Hot Springs where we could relax in a steaming river. The short hike to the steaming river took us about 1 hour and featured a steady incline the entire way. The trail was wide and easy to follow. 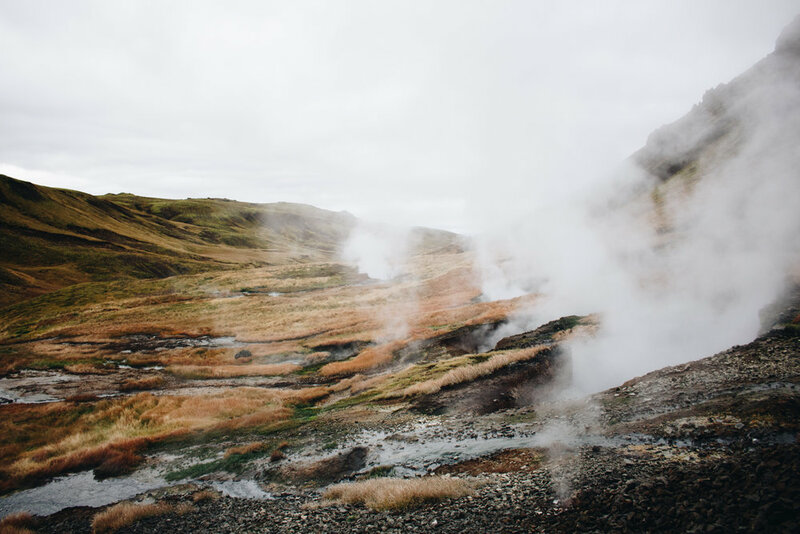 Along the way, we saw several steaming geothermal water holes that created a beautiful, surreal sight. Towards the end of the trail, the river came into view. The areas where people swim and relax had wooden docks and semi-enclosed changing areas. Beware, the changing areas are not extremely private! I recommend bringing a towel for cover if you are concerned about privacy. I had my swimsuit on underneath my clothes which removed my concern about privacy at the onset. Therefore, I only had to change once right before we left. Sitting in the steaming water felt wonderful after a chilly hike. The water gets hotter as you go farther up the river, so it's easy to adjust to your perfect temperature. Once we were satisfied, we quickly dried off, changed into our dry clothes, and hiked back down to our car. Afterwards, we drove to our Airbnb. Unfortunately, the listing for where we stayed is no longer available. However, there are many suitable Airbnb listings in the downtown Reykjavik area. After we unpacked our belongings and rested for a moment, we spent the rest of the evening exploring Reykjavik. We began day 2 by driving out to Haifoss, a spectacular waterfall that was at one point considered to be the second highest in Iceland. While it is no longer the second highest, it still ranks amongst the top and makes for a breath-taking view. The final 15/20 minute or so drive to the waterfall is on dirt roads. Many people recommend not going unless you have a 4x4. However, my group and I were driving a hatchback, and we made it with few problems. If I had to make the drive again though, I would definitely opt for a 4x4 just for peace of mind. Once you arrive at the waterfall, there is a dirt parking area. After a bumpy ride, we reached the waterfall to find that we were the only ones there. 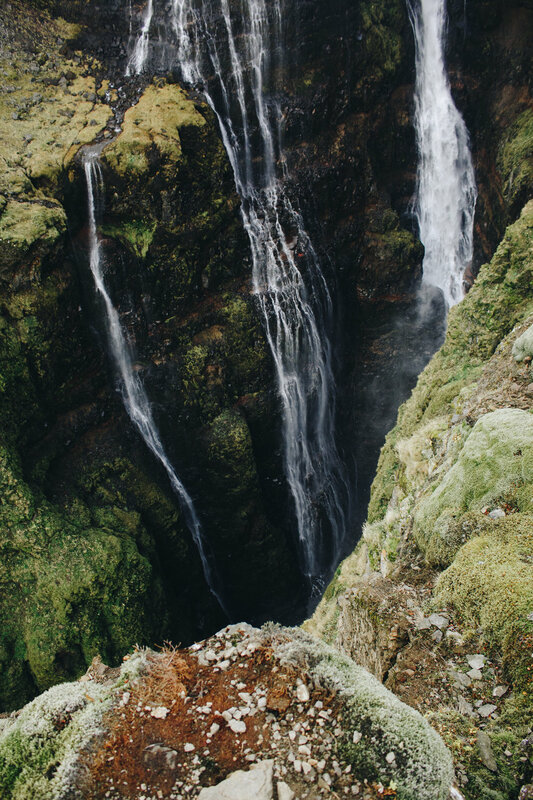 I can't stress how wonderful it was to walk over to the cliffside overlooking the waterfall and the valley with not a single other person in sight. Standing there all alone looking at a beautiful waterfall, hearing the sound of rushing water, feeling the crisp, misty air on my cheeks...it was all so surreal and magical. This was a place that I would visit many, many times if given the opportunity. After we finished enjoying the sights and sounds of Haifoss, we made a quick stop at Stong to see a reconstructed replica of a real Viking farmhouse. It was interesting to have a slight glimpse into Viking history. If you are like my husband and are interested in Vikings and history, then this is the perfect little stop for you. Our day continued with a visit to Strokkur Geyser. I had never seen a geyser erupt before, so I was giddy to witness Strokkur. Since the geyser erupts every 5-10 minutes or so, I stood around and saw it erupt 4 times! I was clearly getting a bit obsessed. The downside to visiting the geyser is that it's a popular tourist spot, so it was of course crowded. Our final stop of the day was Gullfoss. I have to admit that I was not very enthused to go see this waterfall. I knew that it would be crowded, and the pictures that I had seen beforehand didn't exactly wow me. Now that I have seen Gullfoss, I don't think I would go back to see it a second time. However, I'm very glad that I got to see it at least once. Gullfoss is an extremely powerful waterfall that sends a lot of mist up into the air. I would recommend wearing a rain jacket! 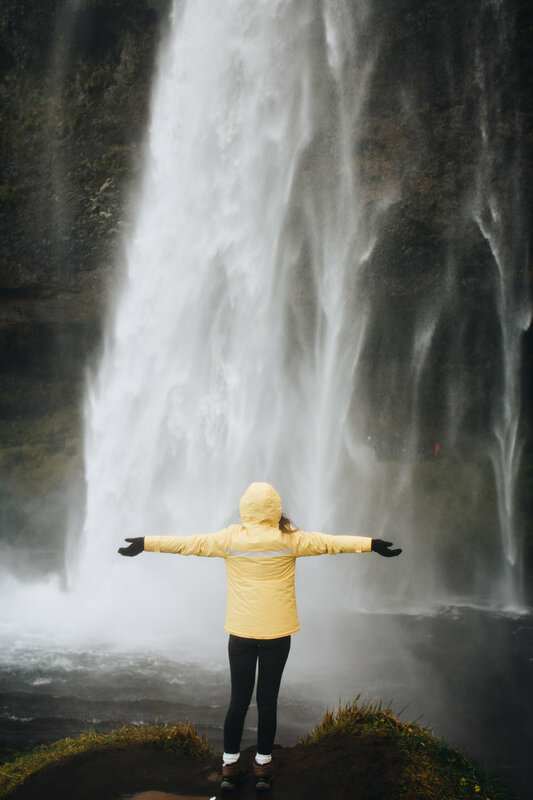 Actually, I just wore my rain jacket everywhere I went in Iceland, because you never know when you'll come into contact with rain, mist, waterfalls, etc. The raw power of Gullfoss is what really blew me away. Standing before this enormous waterfall made me feel small and humbled. I took the time to find a nice, quiet viewing space where people weren't walking around me so that I could have a moment to truly appreciate the strength and beauty of Gullfoss. After a long, full day, we made our way back to Reykjavik for dinner and a good nights rest. Seabaron's space is very limited and cramped, but it was so worth it. The lobster soup was delicious! Day three was filled with some truly spectacular sights! We started the day off by driving to Seljalandsfoss, a beautiful waterfall that you can walk behind! rain jacket--you will get wet! Visiting Seljalandsfoss was an experience that I'll never forget. This waterfall was impressive from the front and something altogether magical from behind. There is a nice, easy to follow path that leads behind the waterfall. The path is close to the falls, so getting wet is inevitable. One person from our group brought an umbrella, and we all took turns standing directly under a small, light waterfall just off to the side. We suddenly turned into children and had a great time playing around in the water. Our next stop was the black sand beach at Vik. When we were there the sky was cloudy which, when combined with the black sand, made for a dramatic sight. Plus, we were the only ones there which allowed for a very enjoyable visit. If you can't tell by now, I don't like crowds! Before we arrived, my husband and our friends were considering going for a quick swim in the ocean. Upon arrival, they decided to opt for just removing their shoes and running through the shallow water. They had a blast running around and freezing their feet off. I, on the other hand, decided to go for a walk to the end of the beach where there were tall cliffs surrounded by hundreds of birds. I'm not a huge fan of birds, but I loved the intensity of standing below the cliffs with all those birds swirling up above me. Next up was Skogafoss. 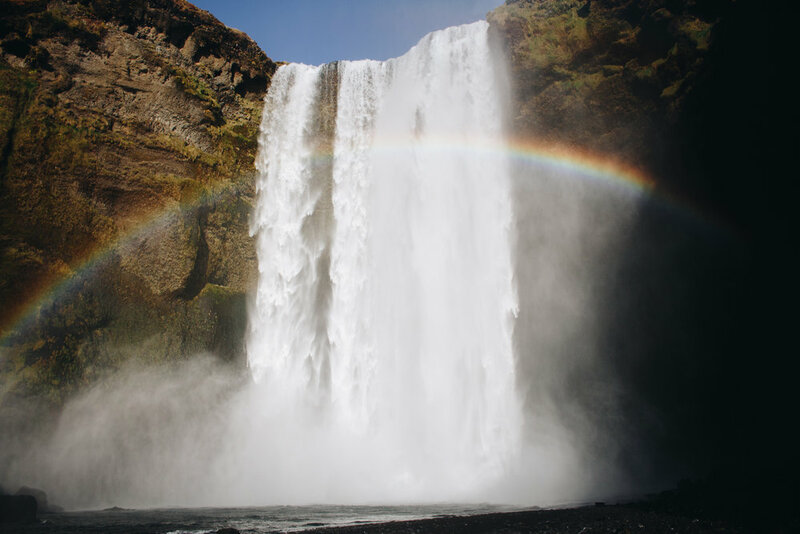 This waterfall is already magnificent, and to top it off, the sun poked out from behind the clouds to reveal a perfect rainbow framing the falls. We were honestly in awe at the perfection of the sight. In order to fully experience the moment, I ran up right in front of the waterfall where nobody else cared to go due to the large amount of mist that the waterfall gave off. 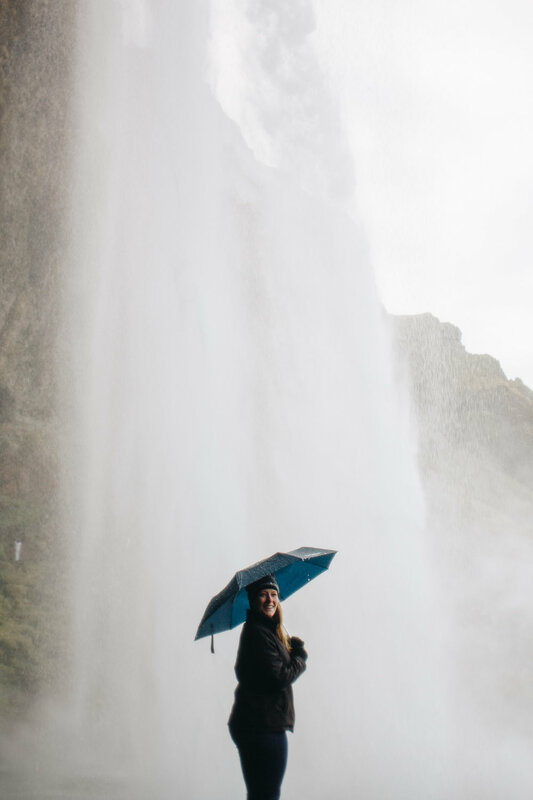 However, I had my rain jacket on and couldn't bare the thought of missing out on standing in front of the beauty that is Skogafoss. Yes, I got completely soaked, but I got to stand directly under a rainbow while gazing up at one of the most magnificent waterfalls I'd ever seen. Completely worth it! 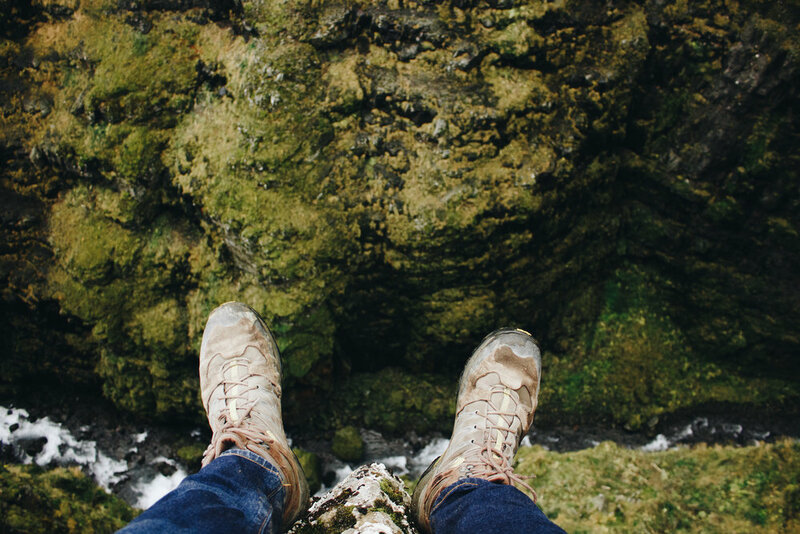 We decided to spend the rest of our daylight by hiking the trails around Skogafoss. There are stairs right next to Skogafoss that take you to the top of the waterfall and the surrounding trail. The trail is easy to walk and provides for many beautiful views of small waterfalls. We walked for about an hour and went back to our car right as it was getting dark. When we got back to Reykjavik, I convinced everyone to drive out to a dark location with me in hopes of seeing the northern lights. I had always dreamed of seeing the northern lights, and I was hopeful that I would finally see some in Iceland. Since we weren't quite sure what would happen and didn't want to drive too far, we decided to drive about 5/10 minutes to the way western side of Seltjarnarnes. There is a walking trail, a golf course, and a lighthouse in the area. Once we arrived, we parked the car, grabbed a blanket and some chocolate, and found a spot in the grass to sit and wait. We spent probably 20 to 30 minutes laying in the grass, goofing off, eating entire bars of chocolate, freezing our butts off, and debating on if the weird clouds we were seeing were actually northern lights. After a while of waiting, we finally started to see some very light green streaks filling certain areas of the sky. At this point, I was already extremely excited and freaking out at the barely visible streaks of green. Luckily, the sky had much more in store for us. Before I knew it, the entire sky was filled with bright, dancing, swirling streaks of green and gold and purple! It was truly one of the most amazing sights of my life. I miss seeing those lights so much that I look up every so often when I'm outside at night in hopes that I'll see even a glimpse of what we saw in Iceland. Day 4 was all about the Snaefellsnes peninsula! This was the most north that we made it while exploring Iceland. Our first stop of the day was Kirkjufell mountain. This mountain is unique due to its spiraling cone shape. Also, there is a small waterfall close next to it which makes for some beautiful photo opportunities. I enjoyed briefly photographing and walking around this pretty area. Bonus: there were not very many people around! Next up was the Saxholl Crater. Initially we were not planning on stoping at this crater, but it's located close to the road so we figured we would make a brief stop and explore. All of us (especially my husband) were very glad that we made this quick stop. Saxholl Crater is a volcanic crater that erupted thousands of years ago! There are convenient steps that lead up to the top of the rim which offers 360 degree views of the ocean and the surrounding lava fields. My husband decided to walk down to the collapsed core of the crater which he thought was one of the coolest things he did while in Iceland. 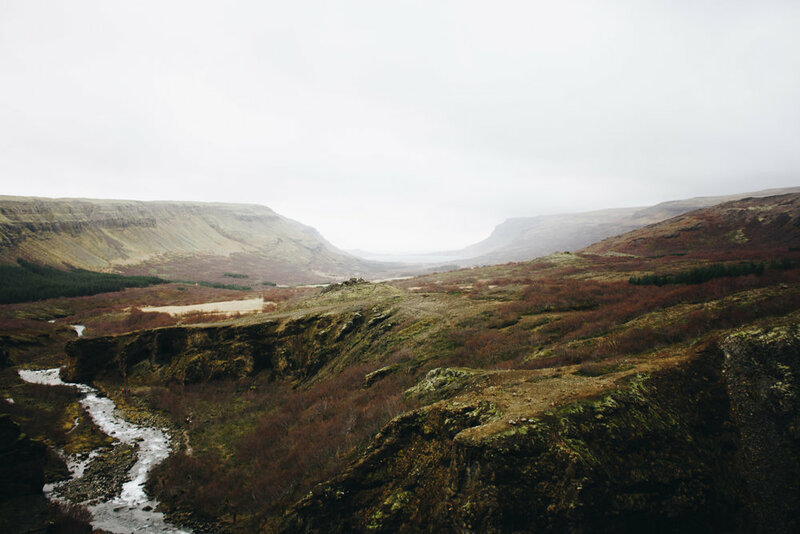 Afterwards, we continued to drive along the coast of Snaefellsnes while gazing at the gorgeous scenery and playing music from Lord of The Rings. Eventually we came upon Gestastofa Visitors Center and the Malarrifsviti Lighthouse and decided to make a stop. After parking the car, my husband and I made a beeline for the ocean (we're obsessed), and our friends decided to go check out the little obstacle course and zip-line. The coast was lined with huge boulders and rocky beaches. It was an obstacle course of our own! We spent our time jumping across the boulders and admiring the crashing waves upon the beach. It was one of the most quiet, serene memories I have of Iceland. From there we drove to Arnarstapi. Arnarstapi is a village in the southern part of the Snaefellsnes peninsula. While the village is nice, what really drew me to this area was the absolutely stunning coastline. We arrived close to sunset time so the sky was filled with pretty purplish hues, the water was a lovely blue, and there on the beach were natural stone formations including a stone arch. Altogether gorgeous! On our way back to Reykjavik, I decided to finally make a stop along the road in an attempt to photograph the cute, funky Icelandic horses that dot the pastures across Iceland. I expected to photograph the horses from a distance, but there were a couple curious ones that came quite close to where we stood. They were fun to see up close! I think we'll have to go horseback riding the next time we go to Iceland. Day 5 was all about hiking Glymur, the second highest waterfall in Iceland. We saved this hike for last since we knew it would be intense and wonderful. The hike to Glymur was one of the most fun hikes I have ever done! Early on in the hike, there are small caves that you have to walk through. Shortly afterwards, there is a river that must be crossed. During the summer months there is a log that sits across the river to help hikers cross. However, since we were there in October, there was no log. We ended up having to take our shoes off and wade through freezing water that came up mid calf. To some that might sound miserable, but it was actually a fun little adventure! Beware, the water is very cold and rushes a bit fast in some areas. It's important to walk slowly, carefully, and with other people when wading across the river. This is when a little towel really came in handy for drying our feet off! The rest of the way up Glymur was filled with a variety of obstacles including steep, slippery areas, rocky areas, and little streams. There were ropes and poles along the parts of the trail that were steep. As we climbed, we continued to be more and more impressed by the scenery. Right alongside the trail is a high, steep, mossy canyon that is a bit nerve-racking, but so so gorgeous. The views of the landscape the whole way up were incredible. 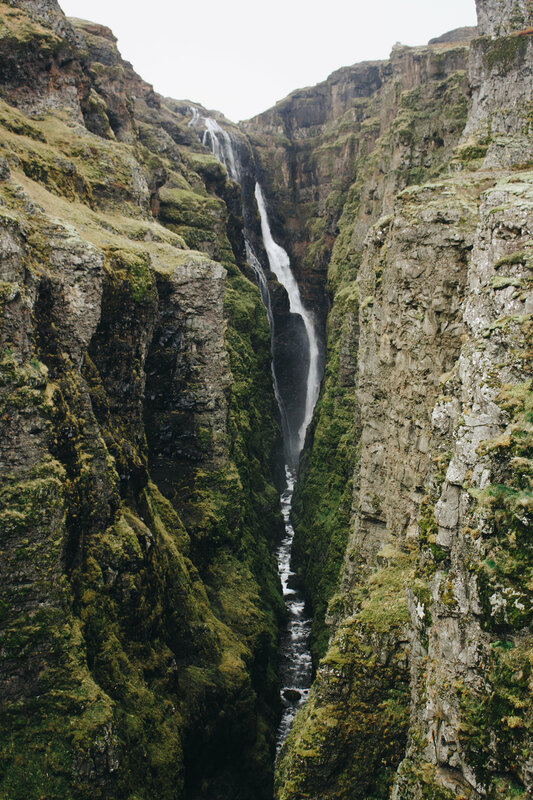 Last but not at all least, we were graced by the view of the second highest waterfall in Iceland! It was truly stunning, and the hike to get there was a blast. Overall, the entire hike took us about 5 hours. It can be accomplished in about 3 hours, but I stopped a lot along the way to take pictures and enjoy the views. After the hike, we were tired and hungry, but we wanted to make a quick stop at Thingvellir and check it out. Thingvellir contains a lot of Icelanic history, and it is also the site where you can see the divide between two tectonic plates! We enjoyed reading about the history of the spot and seeing the unique geological features. Overall, this was a very quick stop for us, and to be honest, I don't think I would return. Once again though, it was nice to see this area at least once. We decided to take it easy on our last day in Iceland. We didn't have much time before we had to make our way to the airport, so we decided to stay in Reykjavik for a yummy final meal and some shopping. I bought a wool blanket from Icewear that I love and use all the time! This place had both great ambiance and food. The menu was small, but everything that our group ordered was delicious. Overall, Iceland was wonderful! I am so happy that we got to experience this beautiful country, and I'm excited to go back and see more! If you have any questions or comments about the trip, comment below! I'd love to hear from you.